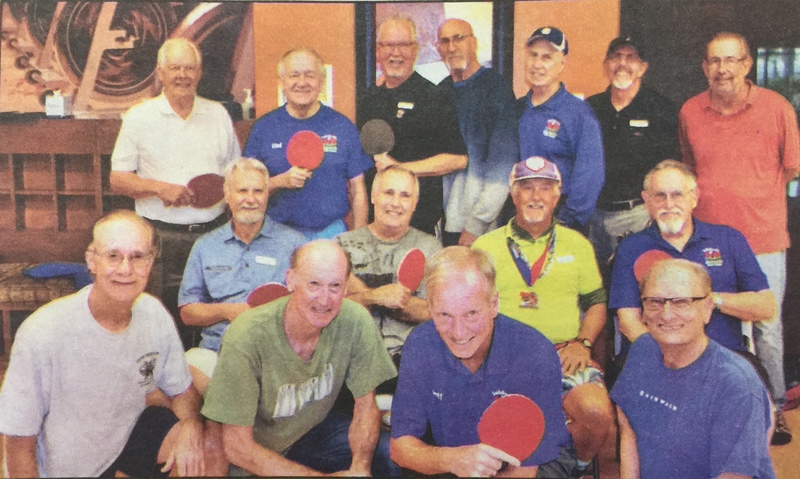 SaddleBrooke Ranch Table Tennis Association (SBRTTA) participated in their first inter-community table tennis tournament against the club from SaddleBrooke, on January 10, 2019. Members participated in both singles and doubles matches. Competition was intense; however, at the end of the day all players had a good time. SBRTTA has 26 members, both male and female. All skill levels are welcome to join this club where having fun is the number one goal. Most of the members begin saying: “I played ping-pong many years ago,” hinting that their skills are poor. But experience shows that it does not take long to regain one’s skills and also have a lot of fun while getting a good workout. Newcomers are welcome to join SBRTTA at La Hacienda Club in the room next to the fitness center on Tuesdays, Wednesdays, and Fridays from 1:30 to 4:30 pm. Please come and join the fun! Top row from left to right: Bert Van Wagoner, Vlad Langer, Lowell Sletten, Dan Plattner, John (Jeb) Bentner, John Hammond, and Steve Chapman. Middle row: Tim Lawler, Bruce Capra, Tom Reuter, and Fred Flanigan. Front row: John Hess, Randy Crane, Jeff Bowen, and Gary Gonzalez. Hey John, don't forget to record me as having paid my dues. John Hammond asked about pro rating dues for members joining during the year. It was decided that due to the small amount of membership dues, they would not be pro rated. Steve Chapman presented the results of the election of officers for 2019. Tom Reuter, President, John Hess, Vice President and Lowell Sletten, Sec/Treasurer. Tom Reuter made the motion to accept the results and Gabor Morocz seconded. Motion passed. Ken Gorman presented the Guest Policy. John Hess stated that Saddlebrooke players want to come and get familiar with our players prior to tournaments. They are unable to come on Fridays, out day for local guests. Steve Chapman suggested changing term from Guest Policy to Guidelines. Decided that it would remain a policy. We decided that we would make an exception for pre tournament play. Gabor Morocz made motion to accept the Guest Policy and John Hess seconded. Motion passed. Tom Reuter provided update regarding robot machine. He emailed a proposal to Tim Fudge including details of three possible machines with a recommendation for one at a cost of approximately $1800. Tim replied that it would have to be approved by the Finance Committee. Tom described how the machine works. John Hess suggested that there will be additional expense to maintain the equipment. Ken Gorman stated that Robson maintains the tennis robot. John Hess provided update regarding tournament play. Saddlebrooke is excited to participate in a tournament and suggested they would be willing to reciprocate every couple months. There is a possible issue with the day of the tournament being on Fridays so it was suggested that the tournament be held on a Thursday. Members in attendance did not feel it would be an issue for those not participating in tournament play to not be able to play on a specified date, however we would need to present this to all members. Lowell Sletten will set up and maintain a folder for waivers. Orderly play was brought up by Ken Gorman, however the idea was tabled for now. Discussed the possibility of members signing up for scheduled sessions of play. No decisions was reached at this time. John Hammond brought the idea of having a SBRTT member luncheon to included spouses/significant others to attend as a social event. John will work towards finding out if there is enough interest and provided the interest is there, proceed with organizing the event. Ken Gorman brought up Group Works and if this is the correct method of communication for SBRTT. Some members dislike Group Works and others do not use it. Ken is working on a possible solution which sounded like it would be a better fit. Consensus was that Group Works should not be the primary form of communication and that most members still prefer email blasts. Lowell Sletten made the motion to adjourn the meeting at 10:40 AM and Tom Reuter seconded. Motion passed! Lowell Sletten presented the treasurer’s report stating the club has a cash balance of $125.00. 1. Waivers – Everyone needs to sign a separate waiver to cover the Board of Directors. Gabor Morocz will be asked to draft the waiver. 2. Proper Attire – Footwear – Ken Gorman made motion stating that “ Players must wear sport shoes appropriate for playing Table Tennis.” Tom Reuter seconded the motion. Motion passed. This will appear in the Policies and Procedures. 3. Tournaments – John Hess will be requested to chair tournament committee. John Hess to initiate possible tournaments. 4. Guest Policy – Proposed that members will be able to invite one “Nonresident” guest on Fridays with no limit as to the number of times. Definition of “Resident” and “Nonresident” was suggested to become an action item. Tom Reuter made a motion that the “Resident” group would include Robson Preferred Guests as well as persons staying with members. Ken Gorman seconded the motion. Motion passed. Tom Reuter to head a committee to research the feasibility of a robot. Jerry Martin will serve on the committee to identify the necessary steps to determine whether or not a robot is feasible. We also discussed if it was necessary to dedicate a table to singles during normal scheduled days of play. Discussed working towards helping all members develop a “legal” serve with the understanding that we are there to have fun. Reminder to Ken to publish Gabor Morocz’s notes regarding resident responsibilities and Robson guest policies. Ken Gorman moved to adjourn the meeting at 10:24 AM. KC Swanson seconded the motion. Meeting was adjourned. The above snippets use Enfeedia's "Super Simple Syndication" eliminating the need to upload any scripts to syndicate feeds. You can explore syndication methods by going to the Enfeedia home page and selecting the "Promote/Syndicate" menu item. You will learn how to fully customize the presentation of the feed on your website. For this feed, use account name SBRTTA and then select feed news.